This chapter provides an introduction to and rationale for the book. It begins by arguing that in today’s technologically rich context, where content and services are increasingly free, we need to rethink approaches to the design of learning activities and content. This chapter begins with an overview of the context of modern education, before looking at the characteristics of today’s learners and how they are using technologies. The concept of ‘learning design’ is introduced and, in particular, the notion that making design processes more explicit and shareable will enable teachers to develop more effective learning environments and interventions for learners. It will help learners to make more sense of their educational provision and associated learning pathways. The ideas described in this book build on an established area of research, which I have been involved with over the past 10 years or so. In particular, it follows on from the development of a learning design toolkit, called DialogPlus,8 as part of a NSF/JISC-funded project and more recently the OULDI work at the Open University.9 In particular, I would like to acknowledge the contributions of this work from the following people: Andrew Brasher, Simon Cross, Paul Clark, Juliette Culver, Nick Freear, Richard Lovelace, Rebecca Galley and Paul Mundin. Aspects of the work described here are related to the Design-Practice, OLnet and OPAL projects; it has been a pleasure working with colleagues on these, both across the UK and Europe. I would also like to thank colleagues who provided comments on the draft chapters on Cloudworks and Dropbox. There are too many people to name individually, but at the risk of offending anyone, particular thanks to Alejandro Armellina, Rory Browne, Simos Retalis, Martin Weller and Sandra Wills. Funding for this work is gratefully acknowledged from the JISC/NSF digital libraries programme, OU strategic funding, the JISC Curriculum Design programme and the EU Commission. Aspects of the work have been published in chapters and journal articles, but this book provides a synthesis of the work to date and provides a clear position/‘take’ on the field. In addition, it aligns this work alongside related learning design research and more broadly research in closely aligned areas (such as instructional design, the learning sciences, pedagogical patterns and OER research). 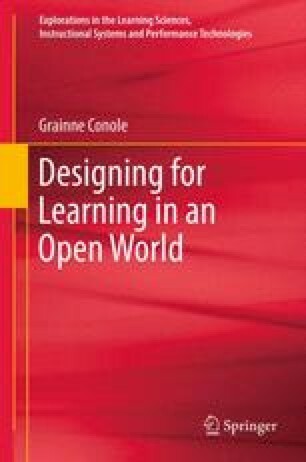 The aim of the book is to provide a synthesis and coherent overview of learning design as a research area, within an educational context that is technologically rich and increasingly open. The learning design approach described aims to enable teachers to create pedagogically effective learning interventions for their learners, which make innovative and appropriate use of technologies, with the ultimate aim of enhancing the learner experience. Borgeman, C., Abelson, H., Dirks, L., Johnson, R., Koedinger, K., Linn, M., et al. (2008). Fostering learning in the networked world: The cyberlearning opportunity and challenge (Report of the NSF Task Force on Cyberlearning). Available online at http://www.nsf.gov/pubs/2008/nsf08204/nsf08204.pdf. Accessed 11 Aug 2011. Conole, G., & Alevizou, P. (2010). Review of the use(s) of Web 2.0 in Higher Education (HE Academy commissioned report). Available online at http://www.heacademy.ac.uk/assets/EvidenceNet/Conole_Alevizou_2010.pdf. Accessed 11 Aug 2011. Goodyear, P. (2005). Educational design and networked learning: Patterns, pattern languages and design practice. Australasian Journal of Educational Technology, 21(1), 82–101. Available online at www.ascilite.org.au/ajet/ajet21/goodyear.html. Accessed 27 Jan 2007. Jenkins, H., Clinton, K., Purushotma, R., Robison, A. J., & Weigel, M. (2006). Confronting the challenges of participatory culture: Media education for the 21st century (MacArthur commissioned report). Available online http://digitallearning.macfound.org/atf/cf/%7B7E45C7E0-A3E0-4B89-AC9C-E807E1B0AE4E%7D/JENKINS_WHITE_PAPER.PDF. Accessed 11 Aug 2011. Molenda, M. (2008). Historical foundations. In M. J. Spector, M. D. Merrill, J. van Merrienboer, & M. P. Driscoll (Eds. ), Handbook of research on educational communications and technology (pp. 3–20). Mahwah: Lawrence Erlbaum Associates. Available online at http://www.aect.org/edtech/edition3/ER5849x_C001.fm.pdf. Accessed 11 Aug 2011. Oblinger, D. G., & Oblinger, J. L. (Eds.). (2005). Educating the net generation [Online]. An Educause ebook publication available at http://routes.open.ac.uk/ixbin/hixclient.exe?_IXDB_=routesand_IXSPFX_=gandsubmitbutton=summaryand%24+with+res_id+is+res19283. Accessed 11Aug 2011. Prensky, M. (2001a). Digital natives, digital immigrants (Vol. 9, No. 5). On the Horizon. Lincoln: NCB University Press. Also available online at http://pre2005.flexiblelearning.net.au/projects/resources/Digital_Natives_Digital_Immigrants.pdf. Accessed 11 Aug 2011. Prensky, M. (2001b). Digital natives, digital immigrants, Part II: Do they really think differently? (Vol. 9, No. 6). On the Horizon. Lincoln: NCB University Press. Also available online at http://www.acpinternational-dc.org/articles/digitalnatives2.pdf. Accessed 20 Dec 2010. Segal, D. (2008). Using computer-simulated case-based scenarios to improve learning. Educause. Available online at http://www.educause.edu/Resources/UsingComputerSimulatedCaseBase/162765. Accessed 11 Aug 2011. Siemens, G. (2004, October 18). Categories of e-learning, blog post. Available online at http://www.elearnspace.org/Articles/elearningcategories.htm. Accessed 11 Aug 2011. Tapscott, D. (1998b). The net generation and the school [online]. Milken Family Foundation. http://routes.open.ac.uk/ixbin/hixclient.exe?_IXDB_=routes%26_IXSPFX_=g%26submit-button=summary%26%24+with+res_id+is+res19300. Accessed 11 Aug 2011.